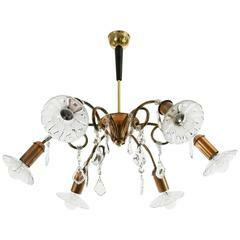 Extreme Large snowflake chandelier in the style of Emil Stejnar for Rupert Nikoll, brass and glass, Austria, 1960s. Has a diameter of 50", its total height 85". Has 31 E27 sockets. The brass Sputnik shaped frame is very elegantly finished with almost 500 x handblown glass. The glass absorb the light very nice which creates a wonderful elegant light partition. Th great chandelier will contribute to a luxurious character of the (hotel-bar) interior. 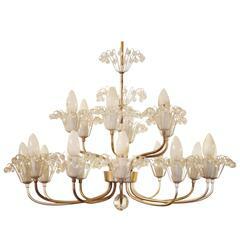 This glamorous delicate chandelier is in excellent condition, in complete working order. 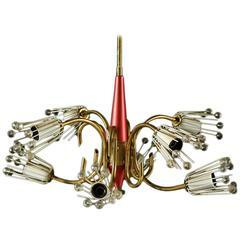 Rare large brass and glass Sputnik chandeliers by Emil Stejnar Excellent original condition Twenty-Two bulbs. Ceiling, frame in brass and colored metal. Eight arms, decorated with glass balls. Height about 63 cm diameter is approximately 52 cm.